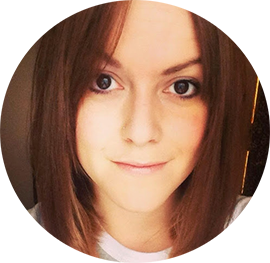 Hair Advice (+ all things nice) | UK Hair Blog: Staffies. They're softer than you think. The latest Battersea Dogs & Cats Home highlights the plight of the Staffordshire Bull Terrier. A misunderstood dog thanks to the negative portrayal in the media. Hundreds of staffies are being left alone and without a home thanks to incapable owners and reluctant re-homers. 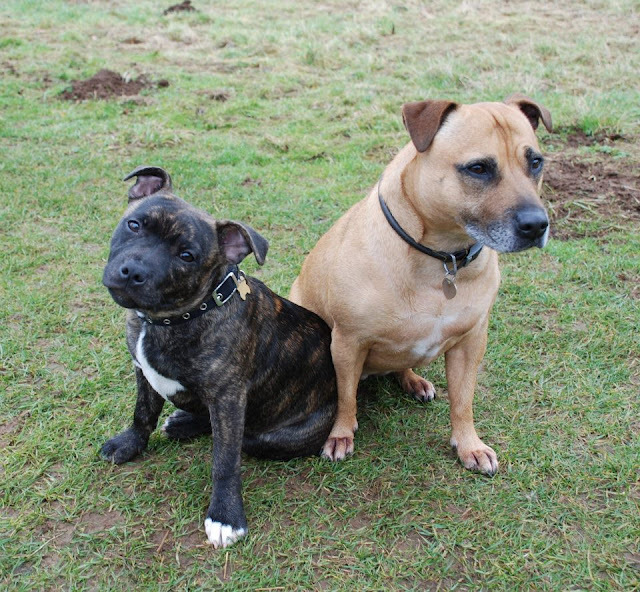 I am the owner of two staffies, Holly & Percie. They have been brought up to not attack, terrorise or injure other dogs and humans, Andy and I have worked extremely hard to make sure they stay good natured and love being part of the family. They are still treated by some, as a dog that should be banned and muzzled, and we have had parents tell children 'to never go near a dog like that, it will bite you' Fear breeds fear, and whilst I'm not saying children shouldn't be wary of ANY dog, warning them away from staffies and giving them the thought that a staffy equals attack is wrong. Due to their strength and hardiness some use staffies as 'status' dogs meaning they are bought to make people fear them and the dog. Many will use the dogs to fight, whether this be in organised illegal dog fighting or as part of gangs. Staffies are there own downfall at times, due to the fact they want nothing more than to please their owner. If they are rewarded for any action be it good or bad they will remember how loved they felt and repeat the action. Looking back on the history of the Staffordshire Bull Terrier would you be surprised if I told you that staffies are affectionately referred to as 'nanny dogs' due to their gentle nature with children? The Kennel Club describe the staffy as "Extremely reliable, highly intelligent and affectionate, especially with children"
Battersea are trying to bring the staffies reputation back to it's best with this campaign, if you want to do your bit, download the cute Facebook timeline, or the desktop background, or even better if you'd like to knit me a staffie I'd be very grateful! 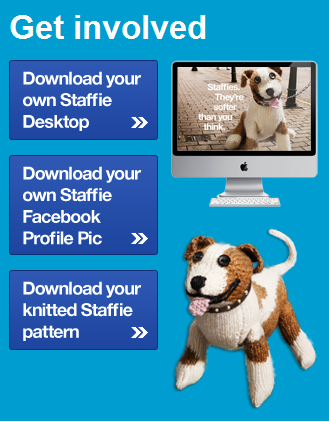 If you feel you could rehome a staffy, click here to register. There was a note about this in yesterday's Guardian and I thought of you straight away. Aren't they cute? (but obviously not as cute as your real beauties). Your dogs are adorable! I completley agree with you. My boyfriends dad and step mum run a dog rescue centre and are doing a sponsored walk with Staffies to highlight their good nature. They have also successfully re-homed many Staffies to families who had previously said them would never take on such a dog! Being a Staffies' owner is not an easy thing, but they are worth it, aren't they?